Hey! Legoless added me to this blog in return for something (no, it wasn’t some Lego) and because I’m a good friend of his, and he asked me to post a review. Hope y’all enjoy it. And, to make a change from the usual PS2 and Wii reviews and the usual faces of Legoless, Guinea and Woof, it’s all fresh today. Today’s review is on a game that’s been out for a few years now, and has gained a total of 8,614,023 plays over it’s two ‘Worlds ‘ alone. Yep, it’s the Fancy Pants Adventures! As normal in a review, I’ll post Graphics, Game play, Content, etc. ratings in the post at the end. In the original Fancy Pants Adventures, there were only 3 levels, cleverly named ‘Level 1’, ‘Level 2’, and ‘Level 3’. And no, I don’t know why ‘S’ is jump either. To kill an enemy, simply jump on it, then jump on it again. The final level of Fancy Pants 1. Kinda disappointing that there’s only 3 levels, but you’ll realize why I got over it later. 😉 The level in itself is quite short, but at the end is your real challenge – The Angry Penguin Guy Dude Thing-A-Majig. To beat him, wait till he charges at the wall, jump out of the way, and then jump on him. Three or four of these should kill him! Last year, Fancy Pants 2 was released. A massive improvement of it’s predecessor, it gained very high praise. So, what’s all the fuss about?! Part 2 of the review will be probably on December 27th or 28th. Ok, so I’m kinda abandoning the Nintendo with Woof for now, its too restricting. The reason I’m reviewing an online game is because its free to play and also highly addictive. The gameplay resembles “Worms” in many ways. The aim is to attack your opponents with a range of spells (which I’ll come to later) and lower their health to zero. Falling into the water isn’t lethal but you lose some health. Now, Most spells require membership (£2 a month, $4 a month appx.) but free players get two free spellbooks (22 Spells) to choose from. Another cool thing is that if you have a Runescape account, you can use it to play because the owners of Runescape also make this game! The game doesn’t have any 1 player so it’s all multiplayer, which could be a problem some, but you can easily turn off the chat feature if your parents are concerned. Arcane Arrow: Fires 3 homing arrows, select the target and then launch. Arcane Bomb:Very similar to the Arcane Arrow except you don’t launch it you throw it as a bomb first. Arcane Tower: A tower that gives you added health. Can be charged up with arcane to have more health. Arcane Gate: Teleports you anywhere on the map. Arcane Portal: Creates 2 portals, 1 above you and 1 anywhere you like. Summon Imps: Creates 3 imps which are powered up by Arcane energy. Imp Destruction: All imps explode into Arcane Arrows. Arcane Glyph: Creates a shield that damages if touched. Arcane Sigil: Creates 3 glyphs, often used to block paths. Arcane Flash: Makes a flash that knocks enemies far. Arcane Zero Shield:Prevents damaging spells from being used on the first turn. Users often criticised for being noobs. Fire Ball: Basic attack, Aim, Fire, Burn. Fire Arrow: Like Arcane arrow but with more fire. Lava Bomb: Again like Arcane Bomb, but with no Arcane. Magma Bomb: Like Lava bomb except it releases more powerful mini-bombs. Flame Shield: Deflects a lot of different attacks. Moves with you. Flame Wall: Like flame shield, except its placed on the ground and if touched with damage you. Napalm Bomb: Like lava bomb, but it releases napalm. Rain of Fire: Fire balls are dropped Air-Strike style. Rain of Arrows: Like Rain of Fire but more accurate and more powerful. Remember if you want more info, just comment! If you want to arrange a game, I’m called dmccol6! This Review Ends With You. Ah its that time again, REVIEW TIME!!! 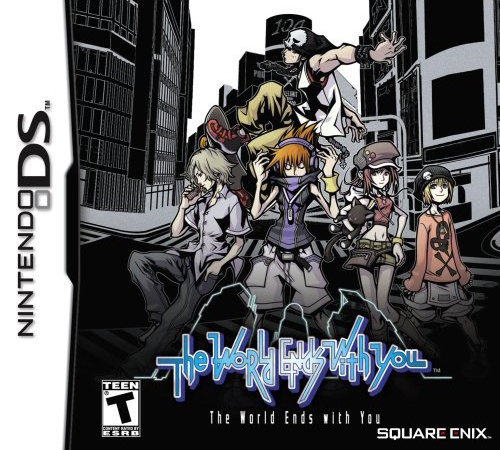 The World Ends With You tells the story of Neku Sakuraba, an unsociable 15-year-old boy who unexpectedly wakes up in the Shibuya in Tokyo, Japan. While trying to piece together his arrival, he receives a strange text message warning him that he will be erased unless he completes a certain mission. Although he barely has time to grasp what is happening to him, he finishes his assigned task in the mysterious streets of Shibuya. Cross Battle System using both screens, You on the bottom, Your partner on the top. You have to control both! Collect custom designed pins, each with a cool ability that can be activated with the right touch or sound. Customize characters with Shibuya’s coolest fashions! Stay on top of the trends, or bend them at your will! An amazing soundtrack from hip-hop to rock to techno. Battle with up to three friends in Tin Pin Slammer, an exciting mini-game, via local wireless connection! Buy it, 100% Buy. You wont regret it!